HAPPIEST OF BIRTHDAYS to my #1 fan, Papadopolous! Enjoy your first day of retirement and eat anything you want! I love you more than donuts! Well, kiddos, I didn’t make my goal. Whomp, whomp. 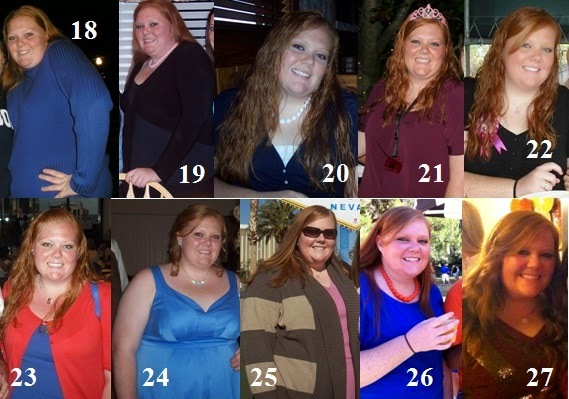 Technically, when I set out on this journey, I wanted to weigh under 200 lbs. by my 28th birthday on the 15th, which I still have time to make. However, I won’t. I’m not giving up. I’m not throwing in the towel. It’s seriously just not possible at this point with 8 pounds to go (unless I get that miracle!). I changed my goal date to December 4th so that it would coincide with a doctor’s appointment, but a few weeks ago I had to reschedule an appointment and that put me back a week. I don’t weigh in at the doc until the 11th. With all this said, I was committed to keeping my goal date at the 4th because that’s what I wrote down and put out to the world. Here’s the thing, I should be devastated that I didn’t make it. I should feel like crap and put myself down for failing but I CAN’T. I didn’t fail anything. Look at me! I lost 84 pounds in 46 weeks. I feel amazing and I wouldn’t trade any cookie, bagel or missed workout. I lived life this year. Yes, it was EXTREMELY hard work and will continue to be a struggle every damn day but I definitely worked my real life into my new life. Of course, there’s a tiny part of me that’s disappointed I’m not where I wanted to be, but the rest of me is overshadowing that part and knows I’ll get there eventually. When I went to Miami a few months ago, I woke up early on the last morning to watch the sunrise. It was overcast and there were clouds completely blocking the horizon. I was one of many people standing on the beach waiting for the sun to come up. In the end, it didn’t disappoint. It was painted with so many different oranges and pinks turning to deep gold and red. Regardless of a little cloud cover, the sunrise was still so beautiful. You, dear reader, are following me on this mission of mine and will hopefully continue to regardless of a cloudy day. I might not have made my goal but in the end I’ll still rise. I’m not perfect. Not everything can go according to plan. When you fall off the wagon, get up, dust yourself off and start running. I’m assuming the wagon is being pulled by very fast horses. Something changed in me in the last few weeks and I realized this is a marathon and not a sprint. It’s not about losing weight the fastest I can, it’s about getting rid of the weight and NEVER gaining it back. I used to beat myself up and get discouraged by a number on the scale and then I woke up. As long as I move in the general right direction, I’m going to be successful. If any of you are disappointed in my failure to reach a goal, sorry I’m not sorry. I would usually say a favorite four-letter F word to you but I like to save those for special occasions as I have to apologize to momma whenever I use one. Thank you Pinterest for all of your crafting, fitness, eating, drinking, clothing, party planning and SO much more glory! After seeing a pin recently for a reward system, I have decided that for every work out I do I am going to pay myself $1. This way, I reward myself with something wearable or a vacation instead of food. I also decided that I am going to retroactively pony up for my work outs from this whole year. As of yesterday, I owe myself $165. With the holidays and my birthday coming up, this seems like a crazy time to start allocating funds to this cause but I really feel like I have earned every penny. Why can’t I reward myself for all of my hard work this past year? That’s right, I CAN! I can’t decide when I’ll cash in though. I was very good to myself, and momma was EVEN better to me, on Black Friday and with the Christmas tree project so there’s nothing I really NEED right now. I think I’ll keep saving my earnings and work out toward a cruise in the spring, which will require a whole new wardrobe, again. If anyone would like to join, I’m currently recruiting friends to bid bon voyage with me. SUPA PROUD time! This week, I’m supa proud of my Papadopolous for tomorrow he crosses off his last day of work and enters RETIREMENT! Congratulations, Dad! We’ll be poppin’ bottles to celebrate over Christmas when I next see you. Now seems like a good time to explain the whole Papadopolous thing. We took a family vacation to celebrate momma’s retirement in June 2013 to Italy, Greece and Croatia. Upon landing in Venice, I started calling dad Papadopolous. I vaguely remember it being the name of a company or something I saw on a sign but it immediately stuck. We debated over the spelling but I think we have a good thing here and there’s no going back now. Tomorrow, as many of you know is D-day. December 4th was when I set to lose 92 lbs. by. I haven’t shared my actual weight in a few weeks to keep you in suspense. I already know the outcome and of course there will be a post about it on Friday. See you then! Tree in all her glory! Happy December, friends! I can’t believe that my favorite month is finally here. For obvious reasons, my birthday and Christmas, December is by far the best. The weather, the holidays, the time with friends and family, and the cupcakes make it #1 out of all 12. I have decided not to do a challenge this month because it’s really difficult to fit in extra work when I’m travelling and so busy. This month has so many events on the books that I’m just asking myself to get behind. I will get back at it with January, I promise. I’m still 4 days away from finishing my squat challenge as Thanksgiving really threw me off. Dang, Turkey. I had to quit the plank portion of my challenge this month because it was causing serious issues with my lower back. To avoid injury, I bowed out. Forgive me, please! With the holiday season upon us and life being about choosing happy, I decided that it was time for a real Christmas tree. I love Christmas trees and always have. Sitting in a dark room with the lights a glow is one of my favorite parts about the holiday. Usually, I put up my tiny table-top PINK tree with colorful ornaments. This year, I wanted to have an adult tree and also wanted it to be my first LIVE tree. As a kid, we always had a fake tree and I’ve never known any different. What better year than this to start something new? I loaded up on ornaments, purchased a stand, finally found a skirt and headed out to find the perfect tree. Those who know me know that I am extremely indecisive, so there I am, dancing around the tent set up in the Lowe’s parking lot looking for a tree. I have no idea what I’m doing! I’m lifting trees up, examining them, judging them and panicking. After about 20 minutes, I find what I believe is the perfect 6-7 ft. Frasier fur and drag it to the check out. After my tree has a fresh cut and is wrapped up, I haul it to my Jeep. Sane people would put it on top of the car but I was afraid I wouldn’t be able to get it up there on my own. Mind you, I did a massive shoulder workout about 4 hours before this. BIG mistake. I put the tree in the trunk and headed home. I carry the tree inside and set it up in the stand ALL BY MYSELF!! I’m covered in sap, dripping sweat and wondering, “When does this get fun?” After nearly 28 years on Earth, I finally know why husbands and boyfriends are needed. This was a lot of work alone and Oliver was no help at all. I wanted to rewind and go back to before I purchased the tree and just get one in a box with pre-strung lights! After an additional ornament run and a few glitter explosions, the tree is complete! I absolutely love it and it smells like Christmas in my house. I think my favorite part about having a real tree is that it isn’t perfect. Its limbs weren’t designed in some factory to be level and even among the tree. The tree has a bare spot and a slightly crooked top but that’s what gives it character. I accept my gorgeous tree for its flaws and sat in awe at what I had accomplished. It may seem like no big deal to some but I’m proud of myself for taking on something and not giving up when it seemed too hard. I wish this tree would last forever because it matches my living room so well! The girliest of trees with glitter, pink and gold ornaments to match my hot pink couch. Your takeaway from today’s post: do even the smallest of things if they make you happy, love imperfections, and with enough determination and endless glitter I could probably rule the world!